Last weekend saw a fleeting visit to Sydney for a family celebration. While I was in town, one of my main priorities was to visit two of my very best friends, Katie and Beau FarmGate, at the Marrickville markets, to gorge on their new season apples and pears (I mean, who doesn’t reserve space in their luggage for fruit?). Last year I spent many weekends working for the FarmGates’ family business, the Nashdale Fruit Co, at farmers’ markets around Sydney, leading to a dangerous addiction to their unwaxed and virtually chemical-free apples. At the peak of this madness I would be eating four a day, sometimes more. Being seasonal however, I began to suffer from withdrawal symptoms as supplies ran low and the weather became warmer. Thankfully the summer months heralded the arrival of their beautiful stone fruit including peaches and cherries which was enough to get me through to Autumn. I found a perfect recipe pairing the nuts with their BFF chocolate in the archives of Australian Gourmet Traveller, which I have reproduced below. These crumbly, bite-sized biscuits originate in Piedmont, famous for its hazelnuts and chocolate. Preheat oven to 180C. 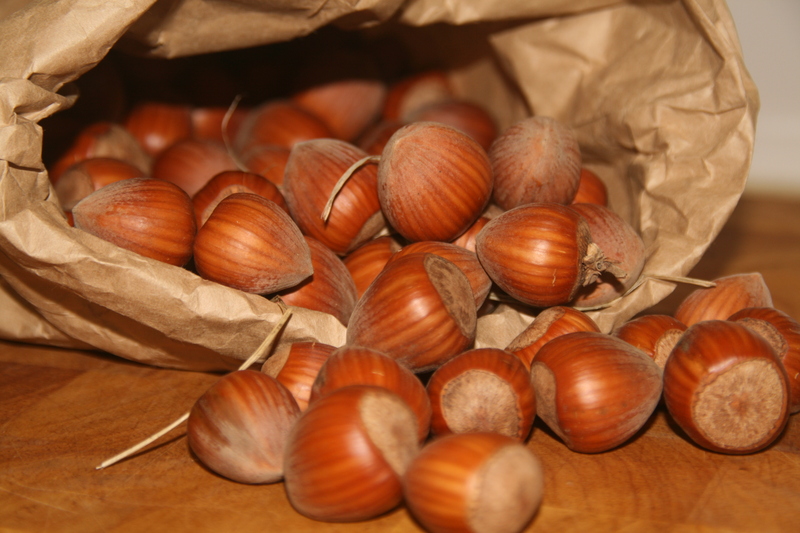 If using hazelnuts in the shell, crack the shells and remove the nuts, roast in the oven for 10 minutes and then, while the nuts are still hot, rub between two tea-towels to remove skins. Using a food processor, process hazelnuts and icing sugar until nuts are finely ground. Using an electric mixer fitted with a paddle, beat butter, rind, vanilla seeds, hazelnut mixture and a large pinch of salt until creamy, then add flour, stirring until just combined (do not overmix). Roll half-teaspoon of dough into balls and arrange about 6cm apart on baking paper-lined oven trays. Bake one tray at a time in centre of oven until golden (12-15 minutes), then cool on trays over a wire rack. Repeat with remaining biscuits. Keep an eye on your biccies as they’re cooking. Our oven tends to be on the hot side and I found they cooked in just under 10 minutes. For chocolate filling, combine chocolate, butter and cream in a heatproof bowl over a saucepan of simmering water, stirring occasionally, until melted. Stir until glossy and smooth, then cool to room temperature. 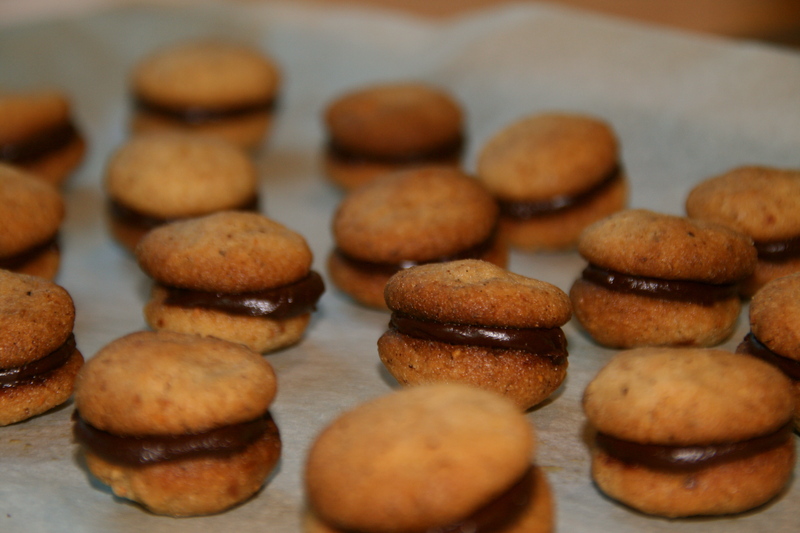 Spread half-teaspoon of chocolate filling onto the flat side of half the biscuits (you may have a little filling left over), then sandwich with remaining biscuits, pressing lightly together to seal. Biscuits will keep in refrigerator in an airtight container for up to 1 week. Bring to room temperature before serving. Visit Nashdale Fruit Co at Manly, Marrickville, Cronulla, Glenbrook, Castle Hill, Rouse Hill, Windsor and Penrith farmers’ markets. Where’s my one?? When I was a kid we had two huge pear trees in the garden and my brother and I used to put them in the hot ashes of the fire to bake them. You need a fairly firm pear for this and to wash off the ashes before you eat them. Delicious. I’ll bring you some tomorrow! I really will! Thanks for the pear-cooking tip, that sounds divine! Oh and by the way I need to get your fish stew recipe off you, the one you made for Tim and me last Easter!! That was one of the most amazing fish meals I have ever eaten. Can not wait to try the above!! Thanks darling heart! I can’t wait for your blog either, it sounds like there are lots of people just as keen as I am to hear more about your farming adventures. Miss you too, will have to organise a trip to the farm after I get back from Adelaide! I live in Marrickville and I keep meaning to get to the markets so now I have one more very good reason to get myself and my two puppies along to buy some beautiful apples. My mum grew up on an apple orchard and is always waxing lyrical about how great the apples were ‘way back when’. You must go! Not only is there delicious food, there are lots of craaazy hippies and an adorable petting zoo!!!! You could do your whole food shop there, it’s great. Oh my, they look astounding! I always wondered what people did with those bags of hazelnuts…. I want to see limpy get more involved with the cooking (and not in a eating him kinda way). I was`one of the fortunate guests who was presented with ladies kisses on Friday night. These were served with coffee and I ate 2 before the coffee arrived!!!! Loved the balance between crisp biscuit and chocolate filling.